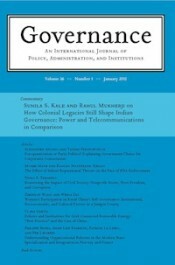 In the current issue of Governance (24.3, July 2011), Christian Jensen (University of Iowa) shows how new processes for adopting legislation in the European Union affected the content of that legislation. The new “codecision” process bolstered the power of the European Parliament, which responded by adopting more legislative amendments designed to give more implementing discretion to member states. On the other hand, the European Council became more aggressive in rejecting parliamentary amendments that limit discretion of the European Commission. “Procedure matters” in explaining why the European Union adopts legislation that locates discretion in different places, Jensen concludes. Changes in legislative procedures have administrative consequences. Read the article: Procedural Change and and the Sources of Ex Ante Constraints in EU Legislation.